I love using a task manager to help keep me organized, and to make sure I don’t drop any balls due to my cluttered brain being constantly overworked. I’ve gone through several iterations, starting with Franklin Planners, evolving to Outlook Tasks, and more recently to smartphone task tools that could “effectively” sync up with all my devices. I have tried a multitude of apps since Windows Phone launched in 2010, and all have failed to provide in at least one area or another. Most especially, syncing across devices. Todoist has been my go to task application for the past 6-8 months and it has yet to fail me. It’s currently available as a desktop/smartphone app across pretty much any platform. Additionally, there are plugins for Outlook & GMail, as well as a Windows 10 beta app. I currently use the Outlook plugin on my office desktop, and rely on the Windows Mobile companion app for most of my other interaction, although the Win 10 beta is installed on all my machines. Today, Boards by Todoist was released as an experimental first-party app in the Windows Store. Being a Universal app, it’s available for download on all Windows 10 & Windows 10 Mobile devices. Ten or fifteen years ago, I might have offered the tip off a pinky finger for something like this, juggling dozens of projects at any one time. Today, my workload is bit more subdued, but I still get involved with projects that involve several steps and sub-steps. Still working on collaboration with my generally, “technology deprived”, coworkers, but I will keep trying. As the Todoist Outlook plugin gives you a minimalist view of your tasks, Boards looks like it will be an nice addition to my desktop. 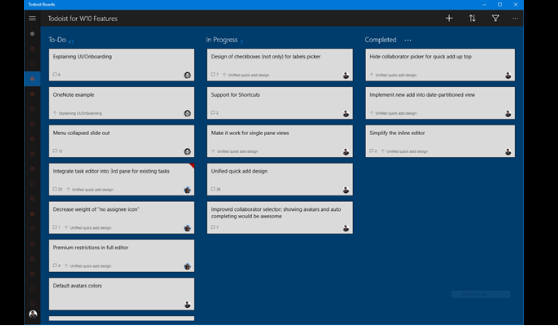 The initial release of Boards is fairly basic, but it essentially allows you to edit and move your tasks through different stages, from To-Do, to In Progress, to Completed. It’s nice to be able to visualize a project on one screen. 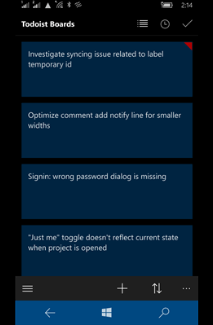 I have used these kinds of interfaces with other Windows Store task apps, but it was part of the interface, whether you wanted to use it or not. And then there was that syncing thing. Lets not go there. All of the tasks in Todoist automatically sync up with Boards, so there is nothing to do to start using it. All of the same features available in Todoist; assigning tasks, leaving comments, uploading attachments, are all available within Boards. Things would really get interesting if you were collaborating with others on a project. I’m trying to find out if Boards will be available on iOS and Android, so that I might be able to collaborate on some projects, but I haven’t found that answer yet. If you’re looking for a great to-do app, you don’t need to look any further than Todoist (or TaskCrunch on Windows 10 Mobile). If you’ve always wished that Todoist offered Kanban type boards to sort through complex projects, your wait is over. 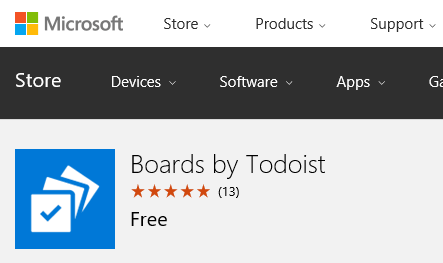 You can download Boards in the Windows Store here.